Most of us think that work life earning may not be sufficient for old age, or say, will have meager valuation in the next 20-30 years. On top, People are concerned about losing their jobs due to technology-assault and super-speed automation. How much of this will prove to be true? To find this, I conducted detailed research and published few papers. This blog is synopsis of all. There shall be continued tussle between both sets of factors (above). Automation and AI is no longer buzz word. Effects are visible across the board, will spread to every possible sector eventually. Despite best efforts by society champions (read politician), socio-economy divide will continue to hound masses. In anticipation, countries like Finland and Canada are running experiments to pilot the idea of "universal basic income" — the unconditional provision of a regular sum of money from the government to support basic living irrespective of employment status. This blog is dedicated to the argument “Democratization of Technology” - which means, access to 'technology-endpoints' (products and services) will plummet abruptly, rendering it almost FREE. As a Business Leader, understanding of this trend and its implications is important. Because, this is connected to Customer buying behavior and how it will transition in the next 10, 20, 30 years. A recent UAE government data* as well as IMF report* (July 2016) show similar patterns in household spend distribution. As expected, housing takes the lion share at 40%, 13% on Food & Beverage, 10% on Transportation, 6% on healthcare, and 5% on Entertainment. In other words, about 74% of UAE residents' expenditures go to housing, food, transportation, health and entertainment. Now, think... what if the cost all the above 6 items plummet with time. There is compelling case behind this hypothesis, which I shall come back after next 2 paragraphs. It is not the first time, this will happen. IMF 2000 millennium data shows - on an average a typical household spent 7% of its income on communication. With the advent of WhatsApp, Skype, Hangout, Facetime etc. this is practically free for anyone carrying the most basic smartphone and internet connection. We democratized communication channels. Whether you are a billionaire or a poor on road, has same quality of communication service – FREE. Google, Wiki, Stanford-web, MIT-web, Khan academy (and many similar) give 100% free access to top quality education content. 20 years back, quality education was luxury. Today numerous free tutorials are available on information highway with the click of button. We democratized access to knowledge. One can think of many similar examples – On the consumer front, examples are photography, publication, entertainment, job market etc. that were accessible only to rich before, is nearly free now. On the business front, there are players who have democratized the once monopolistic nature of businesses – AirBnb x Hotel industry, Uber x Taxi. In fact, as we speak… we are actually using more a million dollar stuff Free. We have taken them for granted. See chart below. Most of us would have purchased these products and services some point in time. Those in 40s and 50s can relate better. Combined cost is nearing 1 million USD. Today every one of us are using same product and services – almost Free. So strange, in todays’ world we do not value these at all. Our expectations have changed, rightly so because in a democratic paradigm things are taken for granted. Think about what drives high housing costs. Why does a single-family apartment in downtown cost $10 million, while the same square footage on the outskirts of city can be purchased for $100,000? Location. Location. Location. People flock to high-density, desired areas near the jobs and the entertainment. This market demand drives up the price. (a) Autonomous Cars: If your commute time can become time to read, relax, sleep, watch a movie, have a meeting — does it matter if your commute is 60 minutes? (b) Virtual Reality: What happens when your workplace is actually a virtual office where your co-workers are avatars? When you no longer need to commute at all. You wake up, plug into your virtual workspace, and telecommute from the farm or from the island of Azure. The second technology drivers are robotics and 3D printing, which will democreatize the cost of building structures. 3D printing has slowly gone from a curious novelty to a totally viable option for creating all kinds of useful things, from chocolate to athletic shoes, and now MIT has invented a way to use the technology to print buildings, too. Given that most 3D printing takes place inside a sealed box, it might be a bit hard to imagine exactly how a structure could be built in such a way, but as you’ll see it can most definitely be done. (MIT printer picture below). A number of players in the market are now exploring how 3D printed structures and buildings can dramatically reduce the cost of construction and the amount of time it takes to build a building. WinSun in China was first to 3D print an entire building, the building was non-functional though. Recently Dubai launched world's first fully functional 3D-printed building (see picture below). 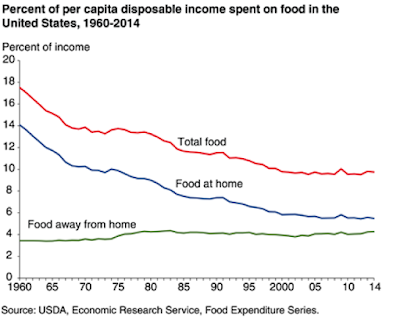 FPO and USDA data suggest that the cost of food cooked at home has dropped by 55%. 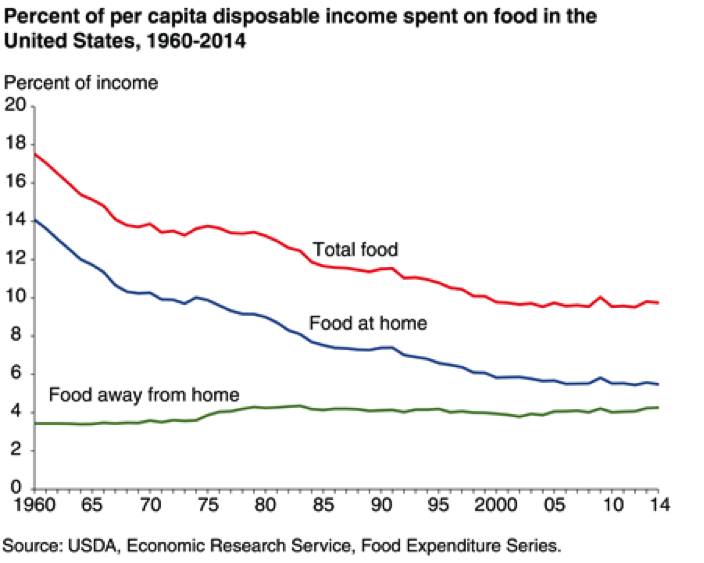 (Cost of food in restaurant has however increased for obvious reasons). The automotive market (a trillion dollars) is being democratized by startups like Uber. But this is just the beginning. When Uber rolls out fully autonomous services, your cost of transportation will plummet. Think about all of the related costs that disappear: auto insurance, auto repairs, parking, fuel, parking tickets. Your overall cost of "getting around" will be 5 to 10 times cheaper when compared to owning a car. This is the future of "movator as a service." Ultimately, the poorest people on Earth will be chauffeured around ! Healthcare can be roughly split into four major categories: (i) diagnostics, (ii) intervention/surgery, (iii) chronic care, and (iv) medicines. (iii) Chronic/Eldercare: Taking care of the aging and the chronically ill will again be done most efficiently through robots. (iv) Medicines: Medicines will be discovered and manufactured more efficiently by AIs and, perhaps in the near future, be compounded at home with the aid of a 3D printing machine that assembles your perfect medicines based on the needs and blood chemistries in that very moment. 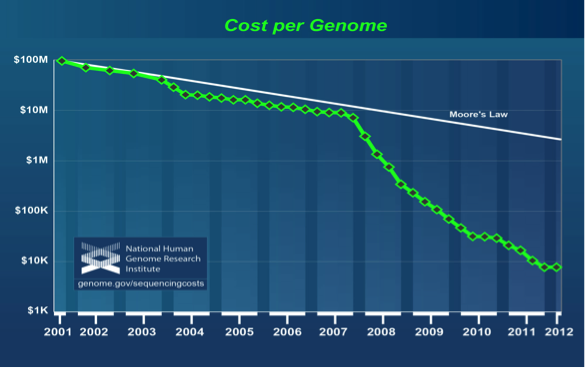 It's also worth noting the price of genomics sequencing is plummeting (as you'll see below, at five times the rate of Moore's Law). Accurate sequencing should allow us to predict which diseases you're likely to develop and which drugs are of highest use to treat you. Education has already been democratized in many respects, as most of the information you'd learn in school is available online for free. But this is just the beginning. Soon the best professors in the world will be AIs able to know the exact abilities, needs, desires and knowledge of a student and teach them exactly what they need in the best fashion at the perfect rate. Well Done Sanjeet. Very futuristic article.